The 2015 National High School Championship became a close battle as it neared its conclusion. During the last round, all four players on the top two boards were tied with a 5.5 score, and they were followed by eighteen other players just half a point away. IM Akshat Chandra had white on board 1 against IM Kesav Viswanadha. Kapil Chandran and FM Cameron Wheeler played on board 2. The latter game finished first as a draw by agreement, which made the result of the 1st board game a decisive championship match. 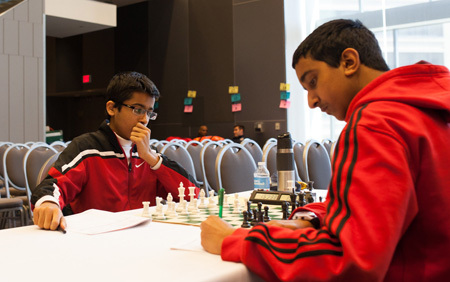 Ultimately, IM Akshat Chandra managed to win his game, and thus became the 2015 National High School champion with a 6.5 score over the 7 round tournament. After his victory, Chandra explained that he did not push harder for a win in his last game after finding out that his counterparts on board 2 had drawn, as he already had a pleasant position. In retrospect, he felt that his first game on Friday was the most challenging, and that perhaps he "did not deserve to win." However, the result of overcoming such a difficult start was that he tried to prepare better for his later opponents. Speaking upon his win and the future, Chandra said that he felt honored to have gained victory at such a prestigious event, and that now he seeks to earn the title of Grandmaster. Ideally, he confided, he would like to achieve balance and success in both his academic work and chess studies. There is little doubt that this thoughtful and very mature young IM will achieve his goals, for he has already shown that he can handle the pressure and reach his ambitions. Monta Vista High School in Cupertino, California won top team honors, led by Cameron Wheeler, who tied for second, and Kesav Viswanadha. 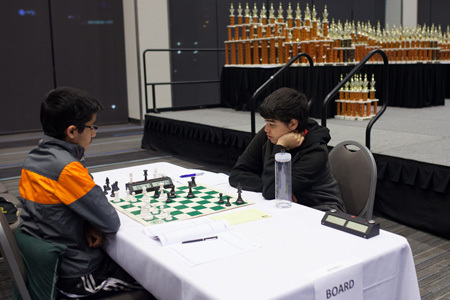 In addition to his success in the Championship, Chandra took away the first-place trophy for the Blitz K-12, with 11.5 points over Christopher Wu, also from New Jersey, on tie breaks. 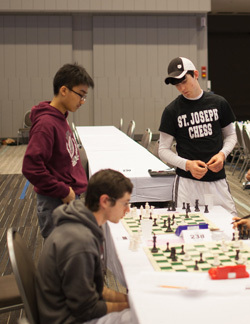 On the Bughouse front, the team of Sun and Wang took away the trophy, while the rated Friends and Family side tournament was won by Ralph Zimmer. Javier Bernal of New York scored a perfect 7-0 in the K-12 Under 1600 while Awty International School in Houston, Texas took top team honors. Robbie Alban Durham of PA swept the Under 1200 section, leading his team Abington High School to clear first in the section. Dennis Nhattien Phan was also perfect in the Under 800 while Waupaca High School of Wisconsin was the top team. Reflecting upon the Championship as a whole, there are also the many stories of the players, their coaches, and families, who convened to make the event possible. Over the days of the tournament, there were many spectators who watched the games from above. Some simply stood and tried to see from the balcony, while others brought binoculars and watched the games move by move. Among these spectators, there was the family of Ben Johnson from St. Joseph, Missouri, who were watching his games with deep interest. After speaking with them, the story behind Ben and his St. Joseph teammates’ journey to the Championship became clear. Led by their coach, Jeff Bird, twenty five of the St. Joseph students traveled to the Championship from Missouri, but it took team effort and hard work. A majority of the students are home schooled, but once a week they gather to take a chess class to further their skills. In order to finance their travel and team gear, they have had to fund raise throughout the year. In addition, their coach made a touching sacrifice on their account. Coach Bird was a finalist for the St Joseph Board of Education, but his interview coincided with the chess tournament. Rather than going to the interview, he chose to come to the tournament instead, because, he said, he had made a commitment to the team. Up until the final round Ben had a perfect score in his section, and his story reflects perfectly the love of chess behind so many of the participants. Without the dedication of the players, their support, and the continuing hard work of the staff and organizers, the National High School Championship would not be nearly as successful as it has been this year. If 2015 is any indication, next year’s Championship ought to bring even more exciting developments. Find full results on this record-breaking National High School here. Find out more about Akshat on his blog, Quest to GM.